Friday night cooking on fire. I love cooking on fire. I have a number of braais – from a Weber to a mini rectangular shallow braai with a lid to a couple of Cobbs. They all get used often. Even when it’s cold out. Tonight’s meal was bone-in rib eye steak (from Boomplaats Farm via Farm Table in Linden) with a winter salad of roast butternut, onion and cherry tomatoes with crunchy kohlrabi and radish on a bed of baby spinach. 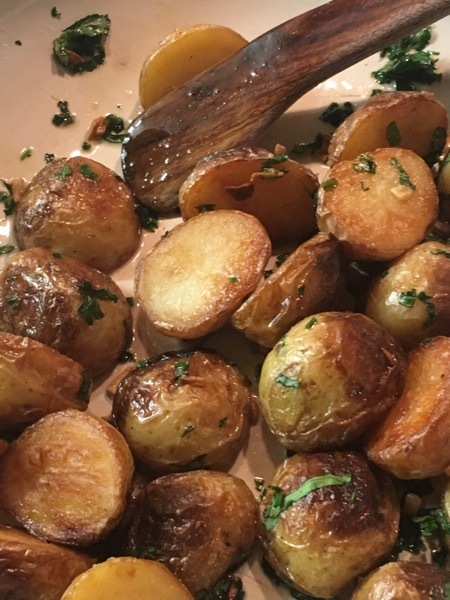 Garlicky roast baby potatoes topped it off. Mix together: 1 & 1⁄2 Tbs chopped oregano, 1 Tbs pul biber (Turkish red pepper), 1 Tbs ground coffee, 1/2 tsp sugar, 1 & 1/2 tsp sea salt, 1/2 tsp ground pepper, 1/4 tsp garlic powder, 1 & 1⁄2 tsp ground cumin. 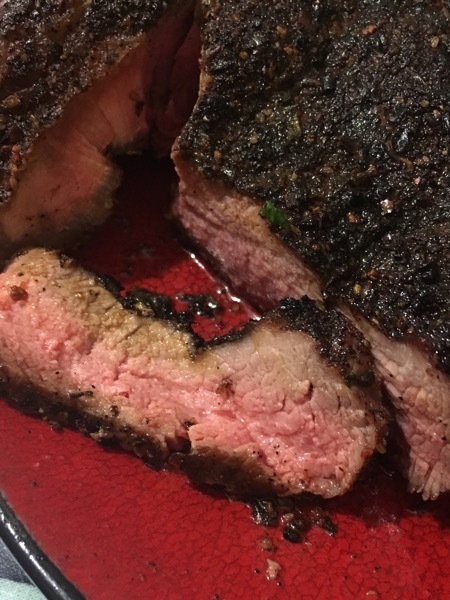 Brush steak with olive oil and sprinkle the spice mix, covering all sides. Leave to sit while you prep the fire, make the salad and potatoes. Cook over hot coals, turning once, until medium rare. Leave to sit, covered, for about seven minutes before serving. Slice butternut (leave skin on) and two onions and mix with olive oil and dried Mediterranean herbs. Roast at 200° until butternut is soft. Add cherry toms for last fifteen minutes. While this is cooking, peel kohlrabi and slice into sticks. Wash baby spinach, dry and place on platter. 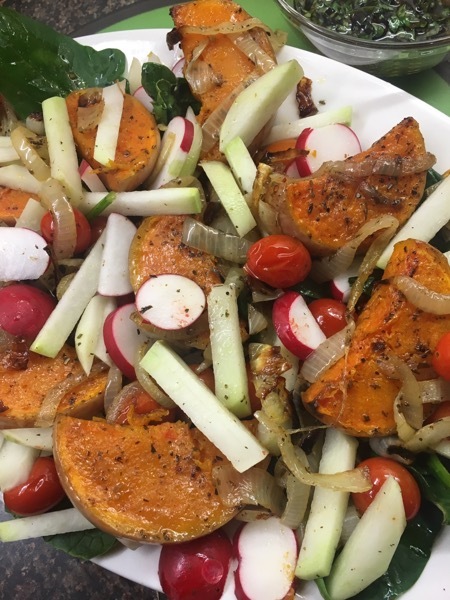 Top with butternut, onion, tomatoes, kohlrabi and radishes. Drizzle with dressing of olive oil, balsamic, basil with salt and pepper to taste. Cut baby potatoes in half and steam until just cooked. Place in hot pan with olive oil and cook over medium to low heat, turning often, until nearly browned. Add chopped garlic and cook until potatoes and garlic are browned. Add chopped chives and parsley, sea salt and a squeeze of lemon. 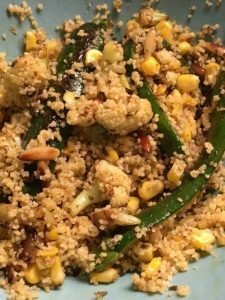 Delicious vegetable cous cous with eggplant and yum chicken breasts. Simple and delicious. And about 45 minutes from walking into the kitchen to sitting down to eat. Start by marinating chicken breasts (skinless and boneless) in whey, or buttermilk, mixed with cayenne pepper, salt and pepper. Leave for about 30 minutes while you prep and cook the rest. 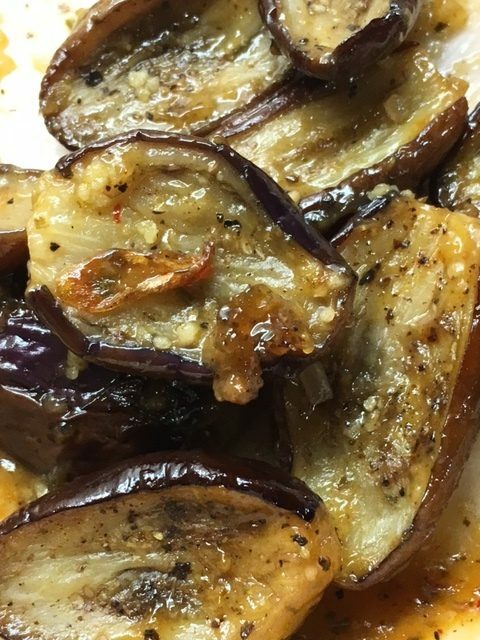 *Slice baby eggplants in half, brush with sesame oil, season with salt and pepper. * Roast at 200° for 30-40 minutes (turn halfway through) til soft. * Toss with Apricot and Chimichurri sauce (made by Nataniel) or something similar. * Sauté cauliflower (broken into small pieces) til just browned. Remove from heat. * Sauté sliced courgette til just browned. Add corn kernels, cauliflower, chopped garlic and pine nuts. Sauté til pine nuts are browned. * Mix cous cous with boiling water and leave to swell. Mix with chermoula paste and add the vegetables. Stir through, flavour with salt and red pepper flakes to taste. * Remove chicken and naartjies from heat. Slice chicken (it will still be pink in the middle) and mix with any yum barbecue sauce (I used Nataniel’s Asian Braai Sauce). Return to pan, reduce heat and toss til cooked through. 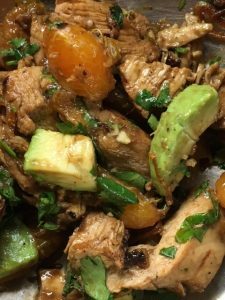 * Mix chicken slices with the naartjie segments, coriander leaves, chopped avocado and crispy fried onions (I get them from Impala Fruit & Veg). Serve the cous cous vegetables topped with the chicken and eggplants. *Note: Don’t leave the chicken for too long in the marinade – both whey and buttermilk will denature protein, which makes the chicken lovely and tender. But left too long it will break down too much and become mushy. The best thin crust pizza recipe . . . 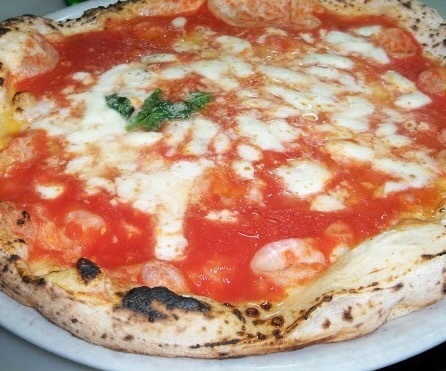 The best pizza I ever tasted was in Naples. I have always preferred a thin crispy pizza base but the Napolese one wasn’t crispy. It was thin and floppy, with the simplest topping of fresh tomato sauce (made from tomatoes grown in volcanic soil of nearby Vesuvius), buffalo mozzarella and basil. Back home the closest I have come to replicating that sublime pizza is the following recipe. I most often cook it until its crispy, but every now and then I don’t, just to remind me of that Autumn week in Naples. Combine the water and yeast in a bowl and stir. Add the salt and flour and mix until combined. Turn the shaggy dough (and any loose flour) onto a floured surface and knead for about 10 minutes until it is smooth and elastic. Shape the dough into a ball and place inside an olive oil greased bowl, turning so the dough is covered with oil. Cover and leave to rise for about an hour and a half, until doubled in size. Preheat the oven to the highest temperature. Place a pizza stone or baking tray in the lower middle part of the oven. Halve the dough with a dough scraper. Take one piece and form it into a large disc using your hands to pull, turn and stretch it. Place it on a 30cm piece of baking paper. If you want it even thinner, use a rolling pin. (It will stick to the paper, but when it bakes, the dough will release from the paper.) If the dough starts shrinking back, leave it to rest for five minutes before trying again. Add your toppings and place the pizza (with the baking paper) in the oven. Bake for about five minutes then rotate the pizza, removing the paper as you do. Bake for a further 5 minutes until the edges are golden brown. This was the pizza from Pizzeria da Michele. We went there on our first night in Naples after a long flight from Joburg via the Middle East to Rome. We shared a hire car with a couple we met at the airport who were also going to Naples. They were heading straight to a pizzeria that claimed to make “The best pizza in the world.” It certainly was the best pizza I’d ever eaten. The following day our guest house owner told us that Julia Roberts had been in town the week before, filming Eat Pray Love. One of the scenes was at the pizzeria where we’d eaten. It was a good start to a holiday!